2016 marked the posting of another 50 blogs on my site! That’s right, I missed exactly two weeks during the entire year, not bad, if I do say so myself! That brings the total number of blogs that are available on my site to 219. The topics vary from camping, to metal working, Medieval Cooking, and researching, and just about everything in between. This year was the year of long blog series, with five of my series having five or more blog entries. A lot of times they didn’t start out that way, but there really was just too much to say! You can easily search my complete collection by either topic or by the year and month. Just go to www.eirny.com and scroll down the page. The right hand column will have a list of the five most recent blogs, followed by a search box for viewing the blogs by month, a newsletter sign up (yes, I also do a weekly newsletter with relevant pre-1600 archaeological finds and news), two collections of links, and then a long list of the categories that the blogs are listed in. Just click on a category the list of blogs. Choosing a favorite blog series is sort of like trying to decide which of my pets I like best, not an easy thing. But if I had to chose my favorite TWO long series, I would choose “Purses”, and “Vardos and Their Cousins”. Both of these series were a LOT of fun to write, and the Facebook commentary was fun and interesting to participate in for both of them. Purses was the longest of my blog series this year, with a total of 12 blogs. It chronicled my experimentation with making a purse frame, from research and understanding how they worked and were worn, through actually making a frame myself. It was a very interesting journey, and I plan to do more work on purses frames again this year. Purses Part 5: What Other Forms of Purse Frames Do We Find? Vardos and Their Cousins had a total of five blogs in the series. It really brought home the variety of Vardos and other trailer based constructs that there are in use in the SCA. And not to be outdone, this lonely little blog: All Rulers Are Not Created Equal, was probably the most relevant to all folks who do ANY sort of craft that ever uses a ruler. Rulers? That doesn’t seem like a very important topic! Well, I have discovered in the last couple of years that all rulers are definitely not created equal. Now in my heart of hearts I knew that there were differences between rulers. 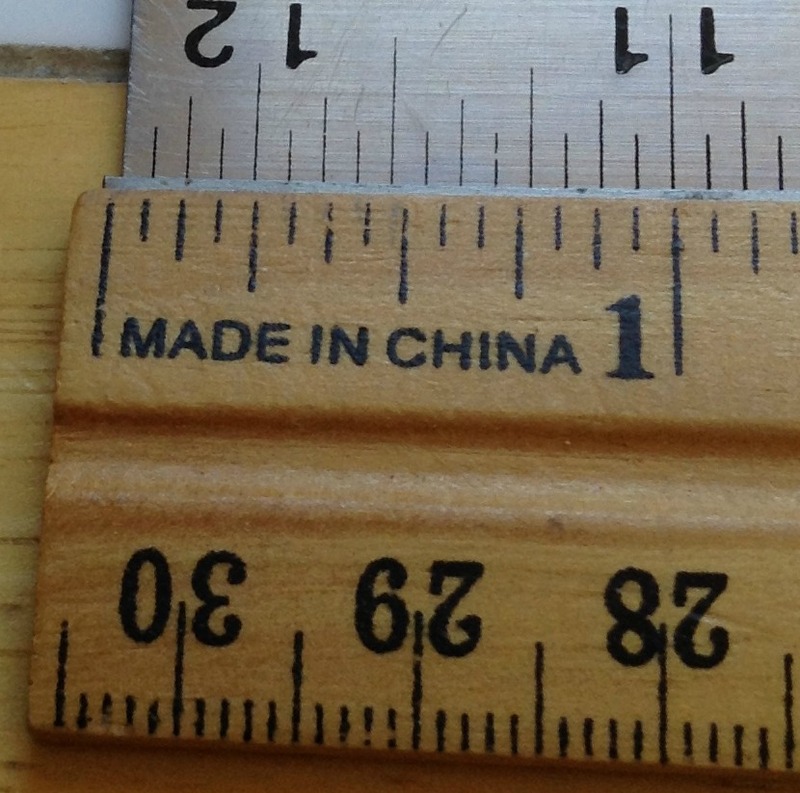 Engineers and machinists use more expensive, and more accurate rulers. But one day, when I was in a hurry, I just grabbed a random plastic ruler to measure the link for a chain, and it came back to bite me later. Whether you are drawing out quilt blocks, measuring a pattern for embroidery, or checking the size of a link in a chain, you need accuracy, and consistency. Most tape measures that we use for sewing are fairly consistent within the tape, but if you have doubts about yours, check it by doubling it back and seeing how well your measurements line up. As you can see in this picture, my tape measurements line up nicely. I always try to buy good tapes for sewing. I got in trouble once by switching between two tapes during a project, and winding up with almost a half inch difference. All of my current tape measures are made in Germany, and even though they are not the same brand, they are consistent. But I still stick with the same tape, just in case. 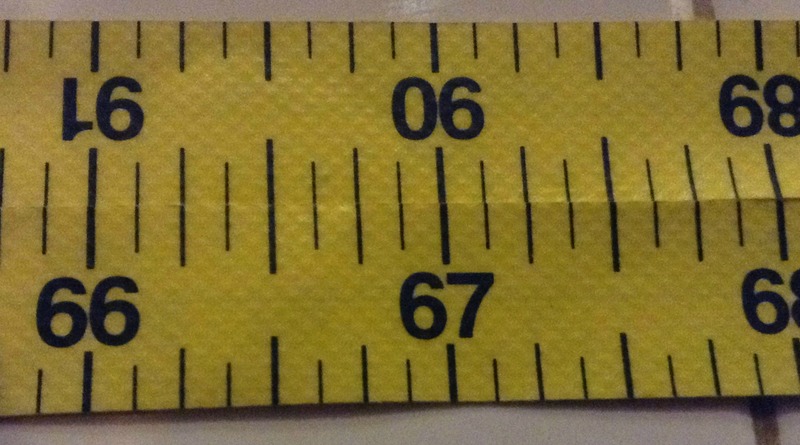 My metal ruler agrees with my white engineers’ ruler, but my little yellow plastic ruler is off by slightly more than 1/16th of an inch over a distance of only four inches. And just because the inches are good, doesn’t mean the centimeters are. I discovered that my lovely metal ruler, with the very reliable inches, has cut off the beginning of the centimeters, and is off by 1/2 mm. Now that may not be an issue for most people, but if I am cutting a piece of metal, or measuring a link, then my ruler needs to be precise. I simply slide in off the edge of the ruler and use the center to do my measuring. Now you may ask, how did I get in trouble with an inaccurate ruler? As a production jeweler, I keep notes about production details. The amount of metal needed for a project, or the size of the rings needed for a particular type of chain. Well, I had notes about a particular chain pattern. And they were wrong. Because the ruler was inaccurate. So, when I went to replicate the pattern. I cut the links the size that the notes said, and they didn’t work, because they are too small. So be aware, all rulers are not created equal.